Charming, older 4-bedroom, 1 ¾ bath home for sale in St. Anthony, Idaho! Estate features beautiful hand-crafted aspen countertops in the kitchen and sun-room, near-new gas range, 4 ceiling fans, high-efficiency gas furnace, beautiful, shaded Trex-deck and outdoor fireplace! But it doesn’t stop there; outside has a fenced back yard, two-bay shop plus garage, an asphalt driveway and RV parking space. 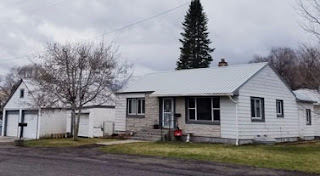 Electrical and windows have been updated, original hardwood floor in living room, laminated-wood flooring in 2 upstairs bedrooms, and nice vinyl in kitchen, bathroom, and dining room. Two bedrooms downstairs; one has an egress window; washer and dryer space in basement; lots of storage space. The yard is easy-to-care, with lovely young trees, a garden spot, and shade from a few older trees in the back. Hollyhocks make this home a beauty every summer! This is a homey home; Grandma loved it; we have loved it; and our renter loves it! A great affordable home for sunbirds, a family, or for a rental unit! This won’t last long so call Hamilton Realty for your private showing at 208-624-4382 priced at $110,000.